Should You Follow Up On Job Prospects? Erin Kennedy, MCD, CMRW, CPRW, BS/HR, is a Certified Master & Executive Resume Writer/Career Consultant, and the president of Professional Resume Services, Inc., home to some of the best resume writers on the planet. She is a nationally published writer and contributor for more than 12 best-selling career books, and is the author of hundreds of career-related articles. She has achieved international recognition following yearly nominations of the prestigious T.O.R.I. (Toast of the Resume Industry) Award. Find her on Twitter @erinkennedycprw. Congratulations! You put together an impressive resume — great! You got an interview — you rock! You made it through the interview, and now… you wait. Right? Cue the litany of nagging questions: Should you call back? Should you send an email? What if you miss the opportunity because you didn’t follow up? What if you miss it because you followed up and annoyed them? Should you wait? But you were so good in that interview… or, at least, you think you were. Wait… were you? What do you do? Don’t worry — These questions happen to the best of us. After Your Interview: You’ve done all you can for now; it’s time to take a break. Go out to dinner, grab a drink with some friends, or go for a walk. Above all else, relax, let it percolate, and try not to think about it for a while. The Next Day: Take some time to go over the entire interview in detail — not in an obsessive, desperate way, but in a “How did I do?” way. Examine what went well, and what didn’t go so well. You should (if you’ve been honest with yourself about the interview) be able to tell the likelihood that you will be called with a job offer. When you have determined how likely the offer is, you can decide how to follow up. If The Interview Went Well: Send an e-mail thanking the interviewers for their time as soon as possible. The next contact you should make is a phone call a week or two after your interview. You should continue this every week for about a month. After that, follow up less often. If you’ve gone for more than two months, it’s time to move on with your job search. If It Went Sour: Send an e-mail thanking them. Consider following up with a phone call a week after the interview. If you end up speaking with the interviewer, be honest. Ask them what they did or did not like during the interview. Was there something else they were looking for in a candidate? Were your skills lacking somewhere? Was it something in the interview that didn’t go well, or perhaps rubbed them the wrong way? You might not always have the opportunity for an open, honest evaluation from the interviewer, as many people do not like to have to be so candid with a job seeker. But if you do, consider it a blessing, as their information or observations might be something you can learn from. Either way, it’s in your best interests to keep your eyes open, look for new opportunities, and not get hung up on the lost opportunity! Takeaway: If a job interview goes sour, send an e-mail thanking them, then seek constructive criticism for the next one. Editor’s Note: Stay Savvy In The Technological Era! 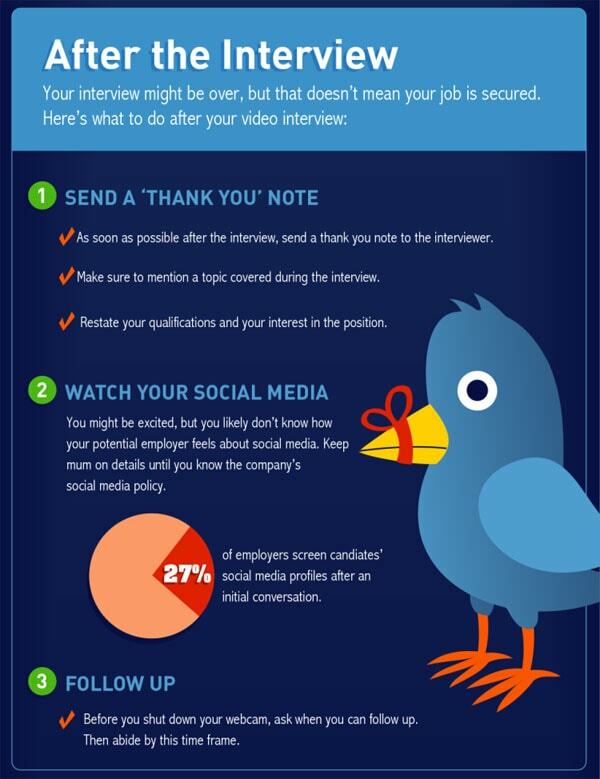 Takeaway: 27% of employers will screen your social media profiles after an interview. Ready to start interviewing? Our recruiters are waiting to put you in front of some of the best hiring companies in the nation? Check out our featured jobs and apply today!